Fatimah Hankins, mother of three, stood on the steps leading to the Louisiana Legislature in February, shivering and windblown. She drove 90 miles to Baton Rouge instead of attending classes at Southern University in New Orleans to gather with hundreds of other worried college students across the state who fear the consequences of staggering state budget deficits on their academic futures. 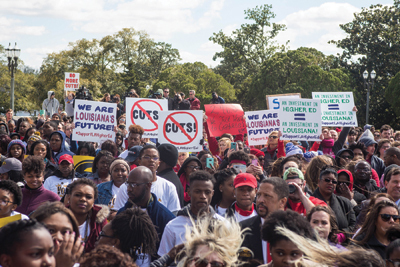 A SUNO professor offered extra credit for students who were willing to join the Feb. 24 student protest of budget cuts to higher education, but Hankins said she would have made the journey anyway. The protest, sponsored by student body presidents and the state Board of Regents, the state’s coordinating board for higher education, was organized to pressure the Legislature into coming up with the money to prevent wide-spread staff and faculty layoffs, increased student fees and possibly cancelling classes before the end of the spring semester. The Division of Administration, facing a $943 million state budget deficit, told the Board of Regents in a January letter that colleges needed to prepare for a possible $131 million cut in funding. The same kind of catastrophic results threatened public-funded health care because health care and higher education always carry the brunt of mid-year budget cutting. Louisiana’s constitution protects almost everything else. Gov. John Bel Edwards told students at the rally that he didn’t want to close campuses. But as a Democrat, his influence over the Republican-led Legislature is weaker than Jindal’s was. He welcomed the protesters and urged them to contact their legislators. Wearing red T-shirts printed with their rallying cry of “Bring on the Heat!” the student protestors chanted, “No More Cuts! No More Cuts! No More Cuts!” in response to a number of speakers that day, but over the long-haul it’s doubtful that their protests will save colleges and universities from a crises that has been brewing for years. The state faces an even bigger deficit in 2016-’17 – a projected $2 billion – that will likely produce the same scary predictions. The outcome of the special legislative session that Gov. Edwards called to avert the 2015-’16 budget crises was unknown at the time that this column was written. But even as protesting students were releasing red balloons outside to symbolize their cause, Legislators were inside considering their options. One of those options was a temporary, 1-cent sales tax increase proposed by Gov. Edwards to help keep colleges and other state agencies functioning until the end of the fiscal year, which ends June 30. The day after the energetic but peaceful student protests, the House voted to adopt the sales tax hike, an indication that some kind of temporary solution was in sight. Maybe the students’ chants were heard through the dense walls that left them out in the cold after all. Then again, maybe legislators are finally beginning to understand the dire situation facing higher education after nearly eight years of continuous budget cuts – a total of $700 million according to the governor’s comments when he addressed rally participants. A few days before the rally, Belle S. Wheelan, president of the Southern Association of Colleges and Schools Commission on Colleges, the southern region’s accrediting agency, informed Commissioner of Administration Jay Dardenne that Louisiana’s public institutions of higher education are in danger of losing accreditation because of financial instability. “If the institutions are unable to demonstrate continued financial stability or continue to enroll students, the Board of SACSCOC would have to consider a public sanction of the institutions or a withdrawal of their accreditation,” Wheelan wrote in a letter posted on the Board of Regent’s website. Because of the reduction in course offerings, Hankins said she will graduate a semester later than she expected. She also was planning to get a master’s degree at a Louisiana university after she graduates in December, but now she’s reconsidering her plans.